A classic varnished wooden boat hook with a chrome plated hook. We use these boat hooks ourselves when launching and lifting boats in our slipway; the strength of the pole is vital for controlled use. 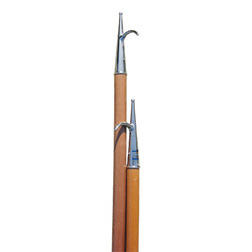 A classic wooden boat hook with smooth varnish finish and chrome plated hook. 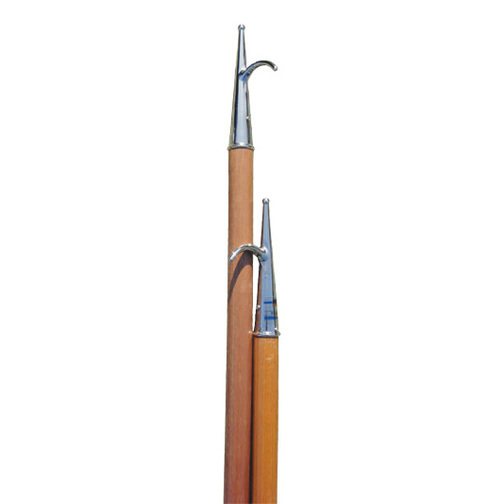 The smooth varnish coating on the wooden handle of the boat hook gives plenty of grip while the strength of the pole provides adequate control for accurate use. The chrome hook has a rounded pointer and curved hook to give different options for use, the rounded pointer is designed to prevent damage and scratching to surfaces. A boat hook is an essential tool to have onboard. It is an extremely useful bit of kit for mooring or emergency situations. It can be used to cast away from moorings or fetching ropes and even stray fenders that are floating away! During an emergency situation book hooks can be very useful too, they can help to rescue people, animals and other overboard items. Please note: The 260cm long classic boat hook is for collection from our River Thames shop only as it is too long for delivery.